Shopping for FurReal Friends Electronics? 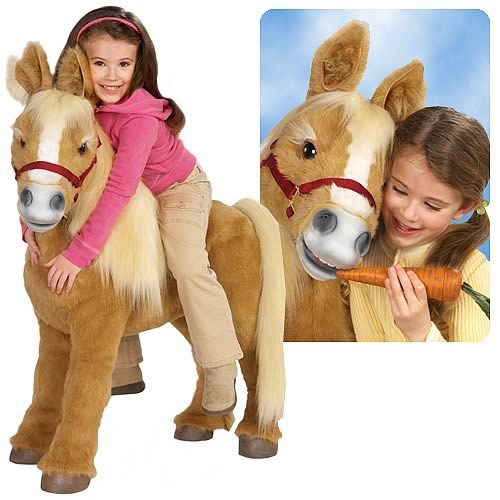 Every kid dreams of having their very own pony! With realistic animation, movement, and sounds, this incredibly life-like pony is a very special, once-in-a-lifetime friend. Standing over 3-feet tall, this adorable pony really "comes alive" as she moves and responds to your loving care! Touch or talk to your pony and her head moves, her ears wiggle, and her eyes blink! Watch her tail swish back and forth as you "feed" and groom your pony. She even whinnies, snorts, and sniffs your hand! Pony includes carrot, brush, halter, and special adoption certificate. Maximum weight limit is 80-pounds, requires 6x "D" batteries, not included. Adults take note: Pony comes unassembled in box with head detatched. You may wish to not open the box around your children if they may be frightened by a box with a decapitated horse inside.